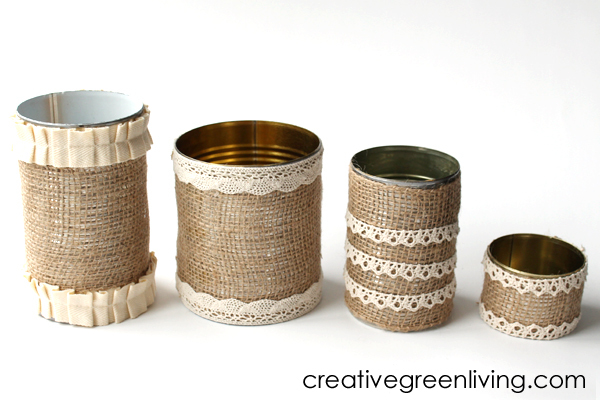 To make planters, wrap empty tin cans with burlap ribbon and secure with hot glue. Due to the holey nature of the burlap, I highly recommend using a silicone finger guard to protect your skin while hot gluing as the glue will seep through the burlap. 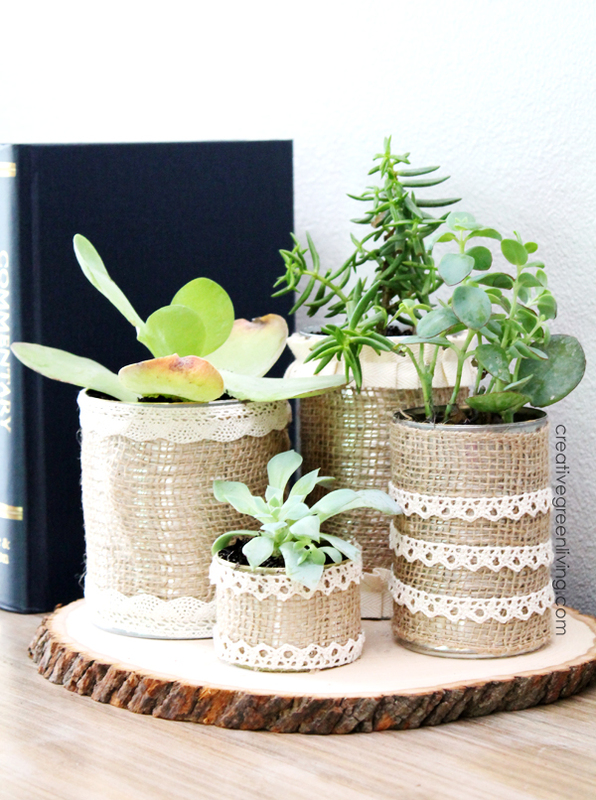 Add accents with a variety of cream colored lace and ribbon (this is a great chance to use up scraps!) --again, securing with hot glue. Succulents are susceptible to root rot if they are over-watered. 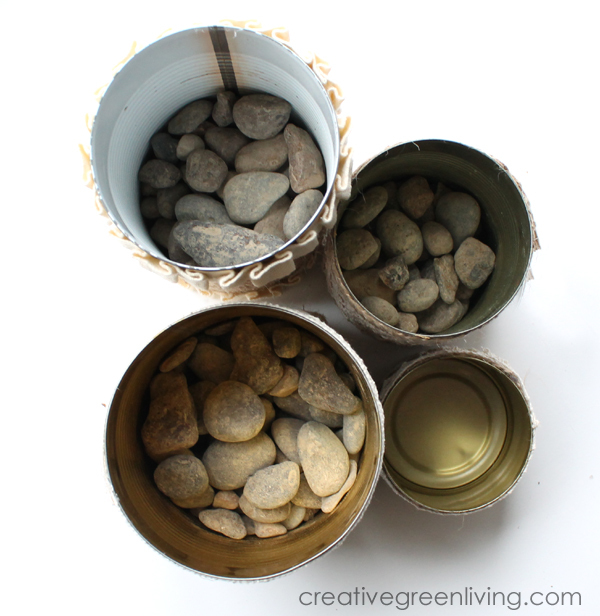 To keep the roots from getting too soggy, fill the bottom half of each can (except the littlest one--in my project, it was already very shallow) with small rocks or pebbles. This creates a "drain off" area for extra water to go after watering. 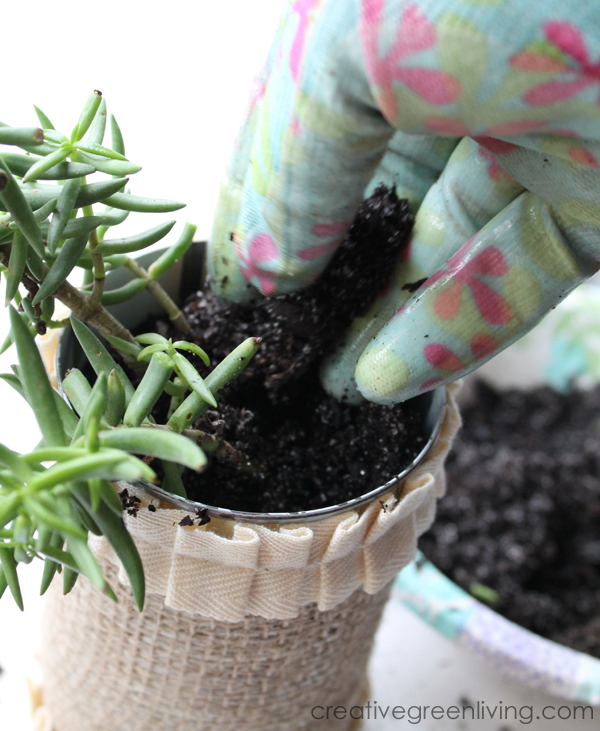 Succulents are very shallowly rooted, so unlike other plants you may have worked with, the dirt in the succulent pots shouldn't be tightly bound up by the roots. Working over a bowl, tip the plant to remove it from the pot and gently remove most of the dirt, letting it fall into the bowl. Add the plant to the desired pot and back fill with the dirt you removed earlier. Repeat with the other cans until each one has a plant. 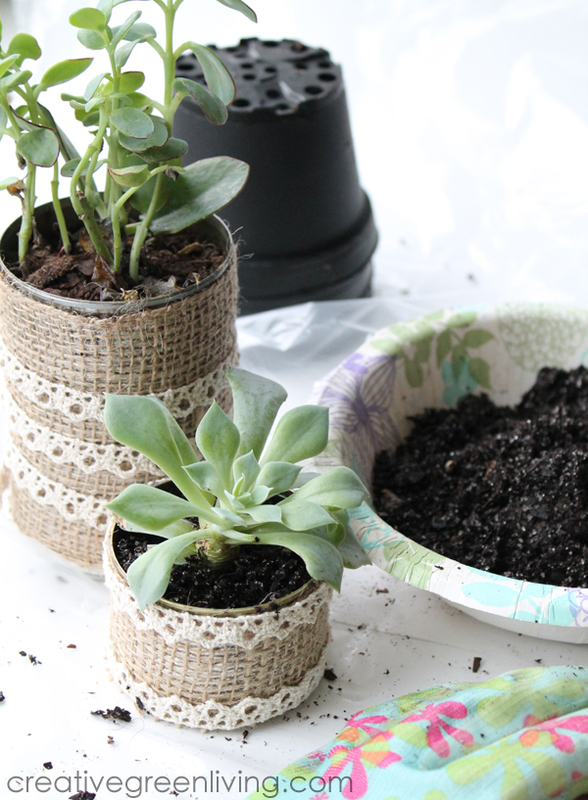 Once your cans are all planted with your Costa Farms succulents, arrange them on a wood round and set it up on your book shelf or console table! Succulents will do best in bright light. Light from windows is great but they'll thrive with artificial light, too. Water your succulents every two to three weeks (set a recurring reminder in your phone so you don't forget!). They don't like to be overwatered, so water them just enough to make the soil damp. When in doubt, err on the side of mild neglect so that you don't accidentally pamper them to death. If you're new to succulents, check out Costa Farms' Guide to Cacti and Succulents. Don't forget to save this post to Pinterest so you can find it later! 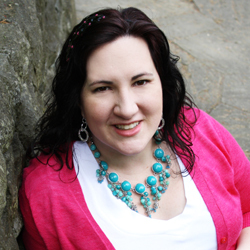 Carissa is a lifelong crafter and mom of two creative boys. The owner and lead writer for Creative Green Living, she is also the author of two books including the best-selling beverage Ecookbook, Infused and Beautiful Smoothie Bowls (coming spring 2017). You can also find her projects featured in magazines like Kids Crafts 1-2-3 and Capper's Farmer. Her goal is to empower families to make easy projects and healthier choices that are beautiful and fun! Follow her on Pinterest, Instagram, Twitter or join the Creative Green Living community group. Sponsored post disclosure: This post was sponsored by Costa Farms. This is my own original project, tutorial and photography. All opinions expressed are 100% mine and reflect my authentic experience with this brand. I only recommend products I personally enjoy and think my readers will as well. For more information, see my full sponsored post and review policy. These are so pretty and would make a great hostess gift for the upcoming holidays. SUCH a cute idea!! 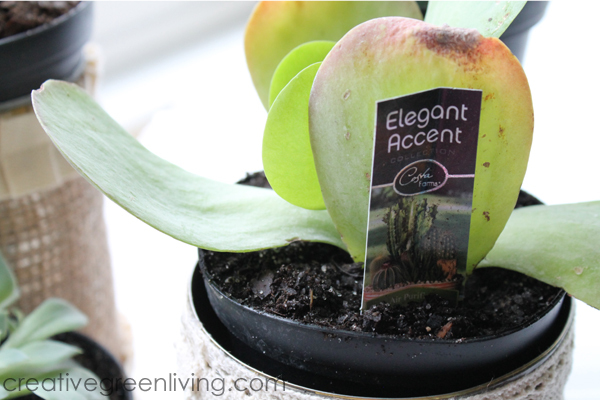 I love how you upcycle and how you can make a succulent garden super fast and easy with this idea. These are so darling! I adore the burlap. What a cute and fun DIY! These look so easy! Love them! I love this idea so much! It would work so many places, a kitchen, a bathroom, an office desk. So easy and so cute!